Perhaps the most obvious deer behaviour is that of the rut. It is believed that the word “rut” is Middle English from the Latin rugire, meaning ‘to roar’. The rut is the breeding season, where males compete for female attention. During this period, males become aggressive to other males and very attentive to the females – there is also typically much vocalisation, sparring and marking of territory/stands. Challenges typically take the form of roaring, parallel walking (to assess size) and clashing of antlers, during which each deer will try to push the other off balance. Sparring in this way allows the settling of disputes without bloodshed. Some deer watchers report that sparring partners may form ‘friendships’ and travel, feed and rest together. In the case of muntjac, the bucks push at each other with their antlers and strike with their canine teeth. Water deer bucks dance around and jump over each other as each attempts to slash the other with its tusks. Generally speaking, the rut is controlled by the females. 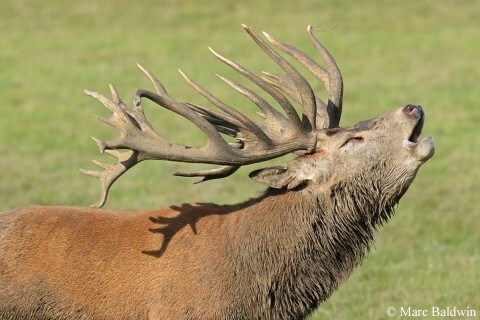 Red stags defend areas of prime grazing land and, by doing so, have access to the majority of the females. Fallow bucks typically (although not in all cases) form leks where they congregate to display to the does, who wander around the males and choose who to mate with. Water deer bucks establish small territories in prime female grazing areas from which they exclude other males. Roe bucks establish territories into which does are pursued in relentless chases terminating in the copulation. Sikas may operate in the same way as Reds, or establish rutting stands that sit between hind resting and feeding sites; the stags stand in these areas and advertise their availability to the passing hinds. 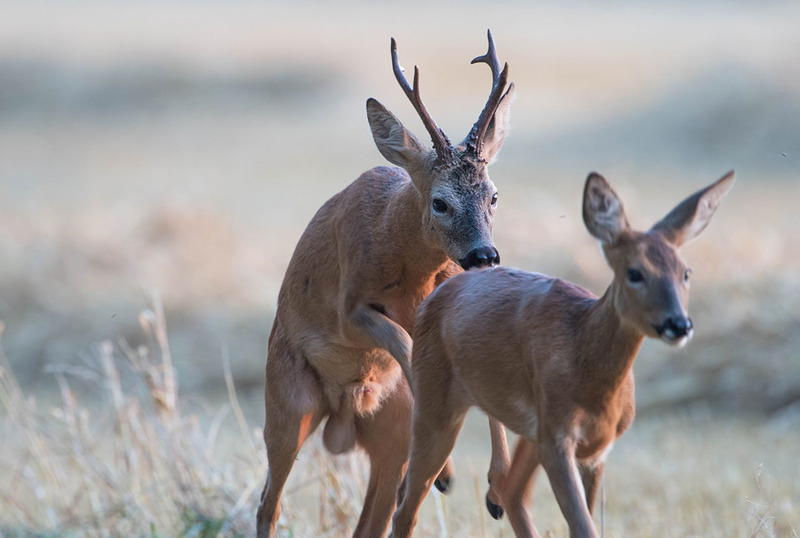 Muntjacs are the only deer species in Britain to breed throughout the year; bucks will mate with any females whose range overlaps with his and may possibly travel short distances out of his territory looking for does. The rut represents a considerable energetic investment for males, which keep up the activity day and night for several weeks, and often leaves the stag/buck physically exhausted. Red, Fallow and Sika rut during the autumn (September and October, with Sika sometimes extending into November), while Roe rut during the summer (July/August) and water deer rut in the winter. In all species, excluding muntjac, young are born during May and June.